This RUST base design is brought to you from our partner xRaW, which is a follow-up base design to his recent Mini Bunker Base Design. The Big Bunker is a strong base, designed for a trio or small team. It’s also important to note that this base design is a starter-to-main base, meaning that the base is designed to be built in stages. While in the early stages, it’s still a functioning base, allowing for you and your team to build up the necessary resources so that you do not overextend. One thing that makes this base special is that it uses a vault mechanic that is low-cost and simple to set up and remove when needed. It provides a triple roof bunker that does not easily splash damage. There are also advanced base design mechanics throughout the base. Featuring a hard-to-loot tool cupboard, compact item placements, a deceptive stability entrance, hard to raid tool cupboard and a solid amount of storage. You will also find anti-raid mechanics for both passive and active defense of the base. This base is a tough nut to crack, requiring over 150 satchels to raid directly to the TC and well over 200-400 satchels if the wrong approach is taken. It’s easily expanded upon and adding additional honeycombing is straight forward. 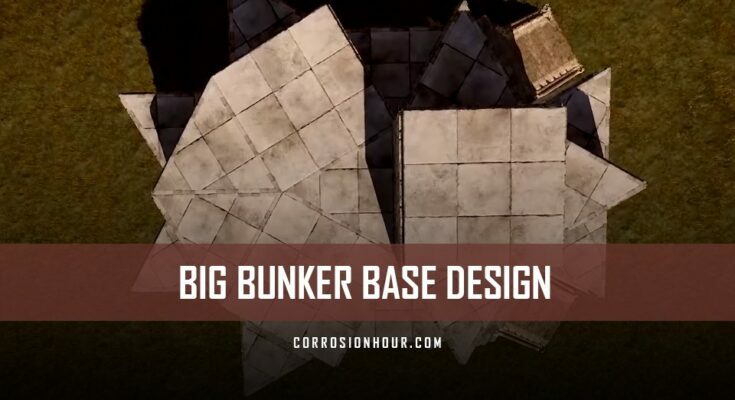 Hey guys and welcome back to another video, in today’s video we’re going to be looking at a rust base design called “the big bunker”, following the same concept as my previous few bases, just bigger. We’ve just hit 2.8k subscribers which is amazing so thank you for the support – there’s a giveaway in the description as a thank you! Coming over to the base here we have a roof to get to the door with some shotgun traps at the side for defense. And coming into the airlock, we have some more traps as well as a mirror airlock on the other side. This is the entrance to the base, but its blocked by 3 interlocking roofs. You need to F1 kill and spawn in your bag and open up the windows here, then remove the twig floors to gain access to your base as normal. You can place some traps here which will be un-drainable to prevent raiders from getting past this stage. In here is the starter section of your base, you have your tool cupboard, research bench, workbench, 6 large boxes, 1 small box, 3 furnaces and your sleeping bag. With plenty of space to get around as well as another un-drainable trap in case they raid from the top. Jumping up here we have an additional un-lootable loot room with 4 boxes as well as a normal loot room with another 4 boxes, you can swap this out for whatever suits you. To seal the bunker up simply place the twig as I show here and then upgrade the roofs to sheet metal – replace the windows and log off! Due to the distance from the top, incendiary rockets will not destroy this. This base is going to cost you 23.8k stone, 6.4k wood, and 9.1k metal, you can use HQM for the core but it’ll be more expensive! The upkeep is 2.1k metal, 4.2k stone and 18 wood! I do a number of base building guides on my channel so feel free to check those out! As always if you did enjoy, be sure to like the video as it really helps out, and subscribe with notifications turned on to catch all of my content!